Does AmblesideOnline have a chronological history sequence? Is the history integrated with literature? Isn't it confusing for a student to be studying two periods of history at the same time? Does it help to show a child a timeline? Does Van Loon's Story of Mankind have an anti-Christian bias? Can I just use Genevieve Foster's books and skip Van Loon's Story of Mankind, or vice versa? Why does AmblesideOnline spend so much time on British history? AmblesideOnline emphasizes Anglo and "western" history. Would the diversity of the US be better perceived by focusing only on US history? If I have an older child who should be starting in year 5, should I start him in year 1 so that he doesn't miss any history? Or should I have him read to catch up in his spare time? Does Year One have a historical era? Is it part of the history rotation? Was CM's teaching of history different than what we're used to seeing in current homeschooling curriculums? Where can I learn more about the method of history study AmblesideOnline follows? Why was the AmblesideOnline History rotation revised in 2002? And what's the gist of the revisions? Is AmblesideOnline's history sequence chronological? Did CM teach history chronologically? Why does the schedule skip some sections of Child's History of the World and also Story Of Mankind? One of AO's old science book has rabbits incorrectly classified as rodents; if old books that are so inaccurate, why is AO using them? Q. Does AmblesideOnline have a chronological history sequence? Answer: There are two rotations, starting with the early middle ages (in Year one) and progressing chronologically until Year 6. At this point, Greek and Roman history are introduced. This enables students to deal with meatier works suitable for older readers. The chronological sequence is continued from Year 7, and in Year 11 or 12 (probably 12), Greco-Roman civilization will probably be approached again. This, again, enables us to present the students with the really complex material necessary to really grapple with the ideas involved. Q. Is the history integrated with literature? Amy T. (AO List Owner/Moderator) answers: To some degree, yes. But not obsessively. Children need to make their own connections to what they are learning, these connections are stronger when they occur naturally instead of being artifically constructed, as can happen with 'canned' unit studies where all literature and other material are integrated and little crafty projects are listed that often have no true relationship with the subject at hand and are merely messy busywork. Charlotte Mason rightly insisted that we not get in the way of the children forming their own relationships with their subjects, and integrated unit studies often do just that by prepacking a time period for a child. It can stifle relationship building by being just a little too 'pat'. That is not to say that including literature, or poetry or music from a time period that is being studied is wrong - it certainly is not, and provides a richer understanding of the culture and times. I am referring to 'closed loop' programs, where little crafts are done and litte poems are included with little to no regard for literary value than because they are 'relevant'. That way lies twaddle! Children are very capable of following up their studies with their own extension activities - such as my children playing at being Lewis and Clark in the afternoons after we read from a book about the Corps of Discovery. They don't need me to invent things for them to do in order to make it real for them - the study is already REAL to them because we are using a Living Book. The AO Advisory has constructed the AO curriculum by following CM's model as closely as possible. Most years read 2 different time frames of history at a time, - ie., American History with This Country of Ours (TCOO), and World History with Hillyer's A Child's History of the World (CHOW). This actually makes for a richer experience, as little "AHA!" moments crop up as a child reads and realizes that an event in the past that he is reading about in Hillyer's CHOW had a great effect on an event in America that he is concurrently studying in TCOO. There are some articles from the Parent's Review posted on the AO website that you might find useful as you prepare to teach history using CM's methods. The Century Book is an ingenious device for 'keeping it all straight'! I urge you to read this article first, because much of the success of a CM education in history rests on this element. The list of Parent's Review articles at the AmblesideOnline website continues to grow. I hope everyone will take advantage of this treasure that is online for our own educations and mother culture. Q. Isn't it confusing for a student to be studying two periods of history at the same time? Does it help to show a child a timeline? Advisory member Wendi: The timelines and maps in textbooks are passive. They're only there to be looked at (like diagrams that CM said didn't do much for students). Timelines and maps CM's way are more active - ie., the student places events and people on the timeline and on the map. This act alone goes a long way, in my opinion, toward helping keep chronology straight. There's even a tiny bit of review everytime they make a new entry as they have to spend a second or two looking over the time line or century book in order to find the right place for the new entry. For maps we have our girls make a small figure on an index card (or a picture) which we place around the border of our large wall map and then connect that with a length of yarn to the proper place on the map. I do think this helps - and the literary language also helps immensely. If you read more than one story at a time, say, something from the Bible and something from Little Women, do our children get characters from those stories mixed up? not usually - I think there's something about the different styles, as well as the different stories, that helps to keep things organized in our minds. Textbooks all sound the same. So maybe it is important not to read a story of American history and one of English history at the same time if they are both written by the same author? Just a thought. Q. Does Van Loon's Story of Mankind have an anti-Christian bias? Answer: Many, many history books have been considered for this curriculum over the years. There were several things to consider -- readability, literary quality, and, not least of all -- availability. But our over-arching principle was always to keep our program as close as possible to what we thought the PNEU would have done, and this book will give your children a broad look at the scope of world history, plus it is well-written and thoughtful. Van Loon does have somewhat of an anti-Christian bias -- parents can deal with it as they go, using it as a springboard for discussion (very CM! ), or choose not to use the book. There are not many choices for a comprehensive world history book at this reading level -- which may explain why Van Loon won the Newberry Award for this book. Q. Can I just use Genevieve Foster's books and skip Van Loon's Story of Mankind, or vice versa? from Volume 6, p. 178 "It is a great thing to possess a pageant of history in the background of one's thoughts. We may not be able to recall this or that circumstance, but, 'the imagination is warmed'; we know that there is a great deal to be said on both sides of every question and are safe from crudities in opinion and rashness in action. The present becomes enriched for us with the wealth of all that has gone before." from Volume 1, p. 280 "The fatal mistake is in the notion that he must learn 'outlines', or a baby edition of the whole history of England, or of Rome, just as he must cover the geography of all the world. Let him, on the contrary, linger pleasantly over the history of a single man, a short period, until he thinks the thoughts of that man, is at home in the ways of that period. Though he is reading and thinking of the lifetime of a single man, he is really getting intimately acquainted with the history of a whole nation for a whole age. Let him spend a year of happy intimacy with Alfred, 'the truth teller,' with the Conqueror, with Richard and Saladin, or with Henry V -- Shakespeare's Henry V -- and with his victorious army. Let him know the great people and the common people, the ways of the court and of the crowd. Let him know what other nations were doing while we at home were doing thus and thus. If he comes to think that the people of another age were truer, larger-hearted, simpler minded than ourselves, that the people of some other land were, at one time, at any rate, better than we, why, so much the better for him." and this is the device that Foster uses in her "World" books. My second daughter was so enchanted with George Washington in Year 2 that I added Foster's George Washington's World to her schedule, and it was wonderful for her to see a panorama snapshot of her hero's time. So, if you have to choose between the "parade" and the "panorama snapshot", you have a tough choice to make. Q. Why does AmblesideOnline spend so much time on British history? Wendi's answer: The final decision of how to parcel out history studies and which country to focus on is, of course, up to each member. For some of us who do not live anywhere near North America, of course, the discussion is going to be a bit different. However, let me share my perspective. I am a US American. I believe that England's history is our history as well - whether we are of western European heiritage or not. The U.S. was settled by English settlers (French, Spanish, and other nations as well, but it was English settlers in the end who primarily colonized this country). The pilgrims were English, they didn't think of themselves any other way. England's History is America's history. Our founding fathers and mothers were English, with English ideas, English traditions, and English history behind them. Since we were an English Colony, King George was once the king of most of the Europeans then on this continent, so the events leading up to his reign would also be our history. Our founding fathers thought of themselves as English right up until the final break (I think I read somewhere that many of those who signed the Declaration were writing articles insisting on their rights as English citizens up until months and even weeks before they felt forced into taking a stand for independence). Their culture, their history, their worldview were all roooted deeply and in and nourished by English history, thought, and culture. This means that their writings, their laws (our constitution, our Declaration of Independence, the Mayflower Compact) and institutions developed out English culture. Our system of government, our legal institutions, much of our culture, are direct descendants of the ideas and thoughts and designs of Englishmen. There's also quite a bit more of English history than there is of strictly American (over 2,000 years vs 350 years, and a chunk of that 350 years overlaps still falls under English history! ), so I think it's a good idea to devote more time to English history than strictly American, just so we can cover it all. And, of course, in many ways, English history is also world history, as England was once the empire where the sun never set. I think it's especially important for US Americans not to be too insular in our thinking. This is all too easy to do since we are a large country borded by two oceans and two friendly nations, and we share a language, more or less, as well. Europeans can drive into the next country in less time than many of us can drive into the next state. These geographical and political realities make it a little harder for us to pick up the kind of knowledge of other countries, cultures, and history that many citizens of other nations pick up as easily as the air they breathe. For this reason, I do think it's important to devote some time to the history that we all share to some degree, and that is mostly English history. Advisory member Donna-Jean adds: I can't expand on Wendi's thoughts at all, she said it so well. She mentioned England's contributions to our Mayflower Compact and Declaration of Independence. It got me thinking of the Magna Carta, which is in the National Archives in Washington, D.C., right by the Declaration of Independence, the Constitution, and the Bill of Rights . . . This body of government gave ideas for FORM and METHOD of both STATE and NATIONAL legislatures English Petition of Right (1628) and English Bill of Rights (1689) These two documents gave ideas for our own BILL OF RIGHTS Mayflower Compact, Charters of Colonies and Articles of Confederation. These offerd the experiences of American colonists themselves IDEAS came from many philosophers, lawyers, and writers, including John Locke, Sir Edward Coke, Montesquieu, Sir William Blackstone. Some of the ideas borrowed were common law, limited government, religious tolerance, consent of governed, separation of powers, rotation in office, written constitution." So to really understand America (if you are an American), it is vital to understand the foundation it is built upon. I think American homeschoolers, in reaction to multiculturalism and 'diversity', are very concerned about American history, and giving it a significant place in their schools. This is good - but we need to remember that American ideas began before American history. Q: AmblesideOnline emphasizes Anglo and "western" history. Would the diversity of the US be better perceived by focusing only on US history? Donna-Jean's response: About the inclusion of British history in the curriculum. Those of us who are Americans on this list may wonder about the wisdom of this. The more I think about it, the more I realize that what we are offering our children is, in actuality, the History of Western Civilization. From the beginnings in ancient history (Greece and Rome), through England and then into the New World, the story of western civilization is the cradle of the freedoms we value today. I am someone who treasures the diversity of this country. On any given sunny morning, I can hear my next-door neighbors outside, speaking Chinese to one another. During our Heritage Day parade Saturday morning (our town celebrates the 4th of July on the weekend before the 4th, for reasons which totally escape me :-) several groups participated (with floats, special costumes, etc.) that represent large numbers of people who came from other countries, such as an Indian group, and a Chinese group. A large section of our public library contains magazines and books in Chinese. Our church has members whose accents denote growing-up years in places like the Philippines or Guatemala. But if my children came from any of those countries (which at one point seemed a strong possibility), I would still emphasize to them their roots in British history. As Americans, those are the roots we must understand to understand our democracy. So much is taking place in recent days in challenging our form of government - and the fact that it is derived from a Judeo-Christian Biblical basis - that I feel we must be strong against a teaching of equivalence of cultures. I want my children - no matter their ethnic origin (two of my three children came to us via adoption, and therefore have different backgrounds than I do) - to recognize the uniqueness of a government founded on Biblical principles . . . and to realize that there is a 'line' for that that predates 1776, or even the Fundamental Orders of Connecticut in 1638 and the Mayflower Compact in 1620. They go back to the Magna Carta of 1215 (which can be viewed, by the way, at the National Archives in Washington, D.C.! . . . a fact which I never knew until last summer!) . . .
Diversity teaches that every culture is equivalent. I disagree. Every person is equal, and every person is of equal value - loved and died for by Jesus Christ - but every culture is not equally important to those of us who embrace freedom and liberty, and the virtue that the Founders knew must accompany it. Again, I am only using your post as a springboard for some thoughts, I am not identifying you with the view I mentioned here. But as a member of the Advisory (who stands in awe of the other ladies on it, I must confess! Continue to pray for us, this is a dedicated and hard-working group of women who seeks after excellence with diligence), I have pondered much about this shift toward British history and the 'why' behind it. I am now confident that it is the right approach for those who embrace the importance of Western Civilization. Q: If I have an older child who should be starting in year 5, should I start him in year 1 so that he doesn't miss any history? Or should I have him read to catch up in his spare time? Advisory member Leslie Smith: It sounds to me like your major concern is that your older child will miss the early study of American History in This Country of Ours. I believe that while you could cover all of This Country of Ours in the next two years, doing so is at the cost of being able to linger and enjoy all the biographies and corresponding literature and covering the 20th century and the ancient history in Year 6. I believe that the biographies are a vital part of a CM history study. For this reason, I really can't recommend starting at the beginning of This Country of Ours in year 5 and rushing through it quickly. The AmblesideOnline history schedule isn't an 11 year rotation such as CM used, it is a 6 year rotation with an ancient history study of Greece and Rome saved until the end of each 6 year rotation to allow for greater maturity while studying pagan cultures. We felt like the new revisions bring us closer to how CM approached history by adding biographical works and proceeding through history more slowly than our previous approach to history, but we also felt that our needs were significantly different than most of CM students in 1920 because most of our students are American or live in New World countires. Therefore we have tried to make allowance to study of New World history in the Years 1-6 instead of waiting until high school. Therefore we study Roman England through the 20th Century in years 1-6 with an introduction to Greek and Roman history in year 6. The history sequence beginning in Roman Britain and covered in Year 1 is taken up again in Year 7 with Churchill's History of the English Speaking Peoples. If you stay with AmblesideOnline and HouseofEducation, then your Year 5 student should get a chance to study the history that was previously covered in Years 1-4 in middle school and high school. What is best really depends on the needs of your children and yourself. What did your Year 5 student study in the last couple of years? How well does your Year 5 student read? Hopefully your Year 5 student can read a good deal of the history and literature selections to herself. If your child has already studied the period covered in Year 5, and has not studied the earlier period then I would consider adjusting the schedule from another year and making alternate biography selections appropriate for that adjusted schedule and the age of your child, but otherwise I would encourage you to stick with the schedule and not try to force more history into a year than is scheduled even if your student hasn't had a chance to study colonial history and earlier. In other words I would try to avoid duplicating prior studies, but I would also try to avoid a quick survey tour of American history as well. It is good to encourage your child to develop a historical sense of a time in history through period literature, biographies, and historical fiction and you can do that as well with the Year 5 and 6 studies as the earlier ones. You can also allow the student to read literature and biographies from the earlier years in their free time as interest and time allows. But, if the student is not interested in these books then doing a quick survey study of history is unlikely to provoke this kind of interest. In general An Island Story and Hillyer's Child's History of the World are most likely too easy to be used as core history texts for Year 5 students. We provide these schedules for convenience to those who need to use them with younger students for some reason, but I can't really recommend them for Year 5 students except, in the case of An Island Story, as an optional follow up study extending the English History along side of This Country of Ours and the world history texts in Year 4 and 5. Your Year 1 student won't get a full schedule of This Country of Ours until year 3 so combining the years is not really convenient because This Country of Ours has shown itself to be too difficult for many year 1 students. And I believe that this newly revised schedule for Year 1 is much more appropriate for most Year 1 students, so hopefully your 6yo should have little difficulty with it. Milo Winter's Aesop's fables is a great place to begin with narration for any age however. Q. Does Year One have a historical era? Is it part of the history rotation? Karen answers: I think it's reasonable for Year 1 to "stand alone." It really is and should be a slightly "easier" year, as most children that age need to focus on phonics/reading, plus they are new to narration, school routines, etc. . . . So, once we are agreed that Year 1 is different, we should be able to construct a "big picture" for Years 2-6. Looking at those 5 years, my deepest instinct is to suggest something as close to chronological as we can get . . .
Form I (Years 1-3) did not do two tracks of history--that begins in Form II. To truly adhere to the PNEU plan, we should try to maintain that structure. We know that they did work chronologically, but didn't necessarily worry about "where they were" when students began--they had to jump into the cycle wherever it was. Let's face facts--we also know that students in the PNEU did not always finish the books. If they were studying from one book in Form II, but moved into Form III before it was finished, they would just move on to reading history from the higher-level book--probably starting in the middle somewhere! Our plan has to be more static than theirs, and most folks are not interested in buying books which will only be partially read. We have to balance "authenticity" with "usability" here, so we end up with something practical, too. Q. Was CM's teaching of history different than what we're used to seeing in current homeschooling curriculums? That's not a bad thing altogether--fewer books read and narrated thoroughly are better than dozens gobbled up for the sake of the story and no more. I know that a plan of 3 four-year history cycles is popular, but trying to get through world history that fast is a break-neck pace that doesn't allow for time to think deeply. Charlotte Mason did not approach history this way. You would never find a PNEU student reading from the ancients to WWII twice within a five-year span. Q. Where can I learn more about the method of history study AmblesideOnline follows? Q. Why was the AmblesideOnline History rotation revised in 2002? And what's the gist of the revisions? A. First of all, AmblesideOnline's primary objective is to offer a curriculum plan that resembles what Charlotte Mason offered in the PNEU. As we continued to study Charlotte Mason's writings and original Parents' Review articles (the PNEU's instructional newsletter), we learned more about her teaching methods and her schools, and we were eager to bring AmblesideOnline's focus even closer to the excellent curriculum plans and methods she designed for the PNEU. 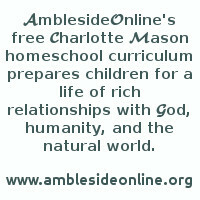 We also want AmblesideOnline to be user-friendly to 21st century homeschoolers, and take advantage of new thinking and ideas -- which Charlotte Mason would have done as well. AO user feedback proved quite useful and revealing in this regard, and we considered user experiences when designing the revisions. As just one example among many, we learned pretty quickly that This Country of Ours, which was read in Year 1 in the old original schedule, proved too difficult for most Year 1 students, but is a stellar book for older elementary students, so in the revision we moved it forward. Q. Is AmblesideOnline's history sequence chronological? Did CM teach history chronologically? A. CM's curriculum for history was generally chronological. Although she had a second thread of history going (usually French alongside English), these were contemporary with each other. Ancient history took the form of reading from Plutarch for the most part, and was not chronological, and there was some general history included from time to time. While we have not duplicated her plan exactly (she had an 11-year rotation, and was able to schedule biographies so that they covered history without many gaps), we have based what we are doing on her plans and principles. For AO and HEO history, we have chosen to follow a chronological procession of English and American History, from Roman Britain to the 20th century. Our primary texts in AO are An Island Story (also called Our Island Story (AIS/OIS) and This Country of Ours (TCOO). World History is studied concurrently, using Hillyer's A Child's History of the World (CHOW) and Van Loon's The Story of Mankind (SOM). You may choose to read either or both of these texts as they meet the needs of your students. We will finish up this chronological progression in term 1 of year 6, devoting that term to the study of 20th century history. In the revised schedule, Ancient History is reserved until the final two terms of Year 6. We feel that more mature students will better understand some of the issues involved with ancient history, and we will also use this time to study Genesis a bit. Studying ancient history at this point also lays the perfect foundation for the history used in Year 7, which starts again with Roman Britain. (In the end, the AmblesideOnline's history will have two 6-year rotations for history, each beginning with Roman Britain and reserving Ancient History and the 20th Century for end of the rotations, so that more mature content will always be met by older students). We are still searching for texts for 20th century history, and for HEO's Ancient History study. Charlotte Mason encouraged the use of biographies, and we have included more of them in the revised curriculum plan, scheduled in such a way as to enhance the chronological progression. We plan to include the biography of at least one important figure each term to complement the historical study, and are still working on locating appropriate titles for some terms. Our biographies will not cover all of history as completely as CM's did, however the Advisory feels this approach allows more emphasis on world history. Q. Why does the schedule skip some sections of A Child's History of the World and also The Story Of Mankind? A. The entire texts of CHOW and SOM are not scheduled -- only those chapters which fit the chronological progression. While this is not the common practice today, CM did use texts in this way. A child might begin reading about history from one book, but when he moved into a higher form, he would be reading the next part of history from a different book, probably picking it up in the middle. You may use either CHOW or SOM, or both, depending upon your students' abilities. In general, CHOW is for younger children and SOM is for older, but AmblesideOnline leaves that choice with the parents. Q. One of AO's old science book has rabbits incorrectly classified as rodents; if old books that are so inaccurate, why is AO using them? A.I think that most of the things that are going to have changed are going to either: 1) be so minor that it doesn't really matter if the child learns the "wrong" information, or 2) be the types of things that we'll recognize have changed and be able to tell them. In the bunny example, growing up and thinking that rabbits are rodents isn't really going to be a big deal. I was taught as a child that rabbits were rodents and found out after college, while researching to learn more about my pet guinea pig, that they aren't considered rodents any more. If I'd never learned that, I'd still be a productive adult. It would be a bigger deal if I'd become a vet, but I would have learned it in some of my vet classes. I'd never become a vet based on the animal science I'd learned in the second grade. We need to remember that while it's very beneficial to have an education that doesn't just cover basic facts, learning "extra" stuff isn't an exact science. Which particular extra stuff is covered doesn't really matter, as long as it's a wide variety of subject areas that stimulates the child's mind. And if a child chooses a career that builds on one of those areas, regardless of whether he becomes a chemist, an art history teacher, or a meteorologist, he'll have advanced education that will thoroughly cover that particular area and clear up any misconceptions he may have based on his early education. Not that we shouldn't try to teach our children what is true, but if they learn things that are a little out of date from time to time, it will either be corrected later on, or it simply won't be important.